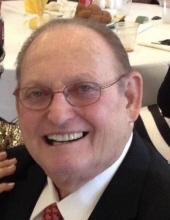 Harold P. Brodsky, 81, of Warrington, PA, passed away on February 7, 2019 surrounded by his loving family. He was the beloved husband of Dorothy L. (Sesta) Brodsky. Harold was born in Brooklyn, NY on March 7, 1937 to the late Arthur and Betty (Tuchman) Brodsky. He was a graduate of Lincoln High School and received his Associates Degree at Brooklyn College. Harold served his country with the U.S. Army and was a District Manager with Ross Labs Division of Abbott Labs for over 37 years. He enjoyed fishing, playing poker, crossword puzzles, theater and fish tanks. Along with his wife, he is survived by 5 children: Russell Brodsky, Mark Brodsky, Susan LaSorsa, Dr. Brian Kerr and Susan Kerr Bernal; 17 grandchildren: Wendy, Samantha, Abigail, Eliza, Paige, Benjamin, Max Brodsky, Marisa, Camryn, Jocelyn LaSorsa, Sofia, Luke and William Bernal, Julia, Rachel Kerr, Rachel and Alexis Coval; 2 sisters: Laura Brodsky and Ellen Osterman. Funeral Services will be held privately. Memorial contributions may be made in memory of Harold to the American Heart Association, 625 W. Ridge Pike Suite A100, Conshohocken, PA 19428. To send flowers or a remembrance gift to the family of Harold P. Brodsky, please visit our Tribute Store. "Email Address" would like to share the life celebration of Harold P. Brodsky. Click on the "link" to go to share a favorite memory or leave a condolence message for the family.